Alastair Roberts is a Calvinistic protestant theologian who lives down the road from me (we have met a few times), and who often has interesting perspectives - for example this essay on the necessity of male pastorship in the church. 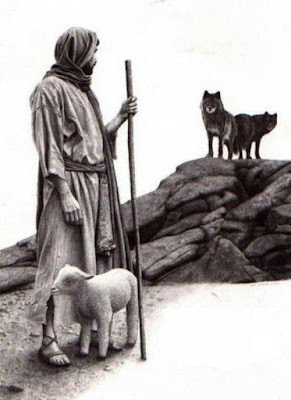 He makes the vital but neglected point that the pastor - modelled on the Good Shepherd - needs to be the tough kind of sheep herder we associate with the young David from the Old Testament; that is a defender of his flock against wolves, bears, lions and whatever else threatens them. He links this with the frequent and vital martial metaphors we see throughout scripture - including the New Testament. This is the proper nature of Christian church leaders, especially in times when the faith is threatened; otherwise, what is the use of churches at all? Church leaders need to be courageous in defense of their lambs against whatever threatens them most - which nowadays includes totalitarian bureaucracy, the mass media, the permanent sexual revolution; and the Establishment and leadership class who aggresively promote and enforce such things. It requires no great powers of spiritual discernment to recognise the utter incapability, unwillingness and collaborationist culpability, of the leadership of current mainstream churches in Albion. Rather than safeguarding their flock, they corrupt, demoralise and prey-upon them. But equally, if such an one does arise - a 'fighting shepherd' (to use Alastair's term), a tough and effective defender of Christianity - then, by contrast, he should be easy to recognise. Some very good points there, Bruce. I had a look at those essays of Alistair Roberts and I think they are very good but they also illustrate a problem. They argue predominantly from a rational/logical or Biblical perspective as do most things along this line. In doing so they take the opposing point of view seriously which, of course, is the civilised thing to do. All that that is fine up to a point. I often try and do the same myself so this is not a criticism of Mr Roberts. However the problem is that truth is truth and and we know it intuitively. It is not a question of reason or logic or even Biblical authority, though all these can support it. We know it and if we go against it then we are rebelling against truth. Jesus and the saints don't argue their case. They state it. Those who take a different stance from the stance of truth, for example over women priests, are denying truth and they are doing so because of undeclared motives. So rational argument is of little use. When motives are faulty then positions taken from those motives will also be faulty and reasonable argument can rarely do much against them unless and until the person has a change of heart. @William - well, of course I have a different metaphysical theology from Alastair as well - nonetheless there is much of value. I agree with your point about intuition (one could say the same about common sense) - but in modernity we are pre-immunised against intuition; and this emphasises (for me, anyway) that we need to have an ultimate, metaphysical, bottom-line explanation of *why* intuition (properly understood) is true: why it is the ultimate form of knowledge. Yes, I agree about common sense which we seem increasingly to have abandoned. And, of course, there are aspects of metaphysics which we do have to work out through a mixture of insight and reason. There's nothing wrong with that. But where the fundamentals are concerned such as the existence of God, the fact that masculine pronouns describe his nature in a way that feminine ones do not (which is not to deny the idea of a feminine aspect to deity) and the fundamental differences between men and women, then I think anyone who takes a contrary view is doing so because of bad faith and some personal agenda usually not disclosed. "And what other kind of shepherd is there?" Or so I would ask except that I remember that in many lands dangerous wild predators are no longer found in regions where flocks are kept. No, now the dangerous predators are found preying on women and children, and they wear human skin.